Between all the ads for diet and exercise plans and the aisles of vitamins and supplements, we're very aware of the importance of maintaining our physical health. But mental and emotional health are just as important. 1. Spend time with others socially. Your mental and emotional health won't be optimal if you split all of your time between work and home. Spend some time in the company of others. Wednesday afternoon staff meetings don't count! Humans are social beings and social interaction is a component of good mental health. Keep your brain active and healthy. Buy a book of crossword puzzles or brainteasers. Play chess or learn a musical instrument. One of the best ways to preserve your brain health is to challenge it each day. Between work, family, and maintaining a home, it can be challenging to find personal time. Nevertheless, spend a little time each day doing something that you enjoy. Even if it's just sitting alone on your deck with a cup of coffee in the morning. Social activity is important. A little solitude is important, too. Your thoughts, attitudes, and expectations mirror those of the people around you. By spending time with positive people, you'll be more positive, too. Whom do you spend time with now? 5. Find a job that you enjoy. Besides sleep, you spend more time working than you do on any other single activity. If your job makes you miserable, your emotional health is sure to suffer. Money isn't everything. Consider finding a career that you enjoy. You'll be happier and more positive about the future. Share your time and yourself with your community. This is also a great social activity. You feel better about yourself and increase your sense of self-worth when you help others. There are plenty of opportunities to volunteer. Investigate a few and make a decision. 7. Spend more time doing things you love to do. What makes you happy? Spend more time doing it. Do you love golf? Build a weekly round of golf into your schedule. How can you not be happier if you spend more time doing things that make you happy? Sleep is necessary for good health, both physical and mental. Those that lose the ability to sleep due to accident or illness die within several weeks. Your ability to manage stress, make smart decisions, and regulate your emotions are dependent on getting enough sleep. 9. Have a compelling future. For your emotional health to be at its best, you need something to look forward to. It might be a date on Saturday night, a vacation, or retiring. It doesn't matter what it is, but you need something in the future that makes you smile when you think of it. 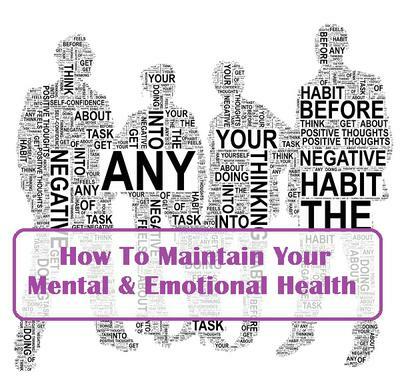 Give you mental health as much attention as you do your physical health. Strive to live a well-rounded life filled with enjoyable activities and people. Get enough sleep and find constructive ways to deal with stress. With good mental health, you'll be able to handle any challenge that life throws at you. Remember to get professional help if you're unable to maintain good mental health. You wouldn't attempt to treat a physical disease by yourself. Put as much importance on your mental health. Avail yourself of expert assistance if necessary.